Our Saturday Oldie this week is a 1950s tv clip. The Delta Rhythm Boys — known for their sense of humor — tell us what happened to some famous walls. For I am ever wandering; but I can hear you beckoning. And I want to walk the deeper walk with you. 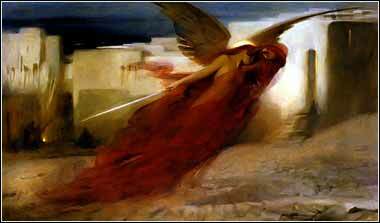 And There Was a Great Cry in Egypt, Arthur Hacker, ca. 1893. When reading this chilling narrative, we must first call to mind the very first events in Exodus 1. 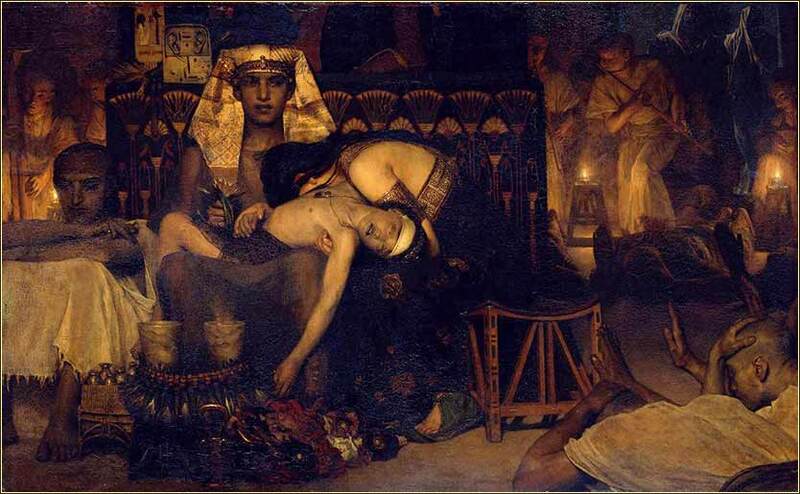 A new Pharaoh, fearful of the size and strength of the Hebrews in Egypt, orders that all male children be killed at birth. We have come, after a long event-filled interval, to God's justice. In fact, Julia Ward Howe's line, "He hath loosed the fateful lightning of His terrible swift sword," is only half right. For God's retribution is often slow in our perspective. We see analogies in everyday life. The heavy cigarette smoker lives without consequences for decades. Bernie Madoff lived like a king off the billions of dollars he has swindled for 30 years. Perhaps, in these cases, God simply wants us to learn about sin and long-term consequences. For He often calls upon us to put aside the immediate pleasure for a great gain, far in the future. The sinner, the idolater and atheist, the thief and the licentious: they live among us, often, like Pharaoh, as the rich, beautiful, and powerful of society. But they are called to account, as are we all. The Lord has told Moses that the Exodus is a lesson for all generations; let us learn it well. When the terrible event occurs, the Hebrews are ready to walk out the door. They are wearing their sandals and their staffs are in their hands; they have gathered gold and jewels from their neighbors; and, symbolically, they even ate their supper standing up. So when Pharaoh summons them and says "Leave! ", they do not say, "give us time to prepare." The Lord has taught them and they have wisely followed His instruction. And as a final note, Pharaoh asks for their blessing. He is defeated, not merely in battle, but also in pride. He acknowledges (at least for the moment) the supremacy of Yahweh; his voice, accustomed only to command, is used in supplication.